In 2nd grade Lee told me that if we would wear our shoes backwards it would make our feet like Indian braves and no one would be able to track us. We only did that for one day. Lee was a great guy. He will be dearly missed. Anyone that had a chance to meet him in life was truly blessed. ! KERNERSVILLE – Roger Lee Nelson, Jr., 56, passed away Monday, March 23, 2015 at Wake Forest Baptist Health Center. Lee was born on August 11, 1958 in Forsyth County to Roger and Carol Marshall Nelson. He was an East Forsyth High School graduate where he was a member of the Football Team and then graduated from Western Carolina University. After his service in the US Marine Corp, Lee began his career with the Winston Salem Police Department as President of Public Safety Officer Class #14 (1982)… being sworn in as an Officer in 1983 and was promoted to Police Sergeant in 1994. During his 28 year career with WSPD, retired Sgt. Roger Lee Nelson was assigned to many specialized units, including Special Enforcement Team, Motorcycle Unit, Bomb Technician, Criminal Investigations Division –Robbery Squad and Training Division as a Firearms Instructor and Rangemaster. He was a dedicated instructor, teaching firearms and hazardous materials classes to countless new WSPD Trainees and selflessly provided training for numerous outside agencies. Throughout his career, Lee earned many commendations for outstanding performance, most notably, the Department’s most prestigious Medal of Valor award in 1989. 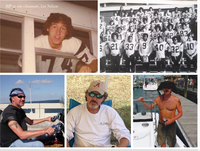 Lee's passion in life was salt water fishing and motorcycles. Lee is survived by two sons, Matthew Nelson of Korea and Michael Nelson of AL; his parents, Roger and Carol Nelson of Kernersville; a brother, David Nelson (wife, Sherri) of King; and two nephews, Glenn and Dalton Nelson. A memorial service will be held at 2:00 p.m. Thursday, March 26, 2015 at First Baptist Church of Kernersville. Burial will follow at Mt. Gur Cemetery. The family will receive friends from 11:30 – 1:30 p.m. Thursday, prior to the service at the church. Hayworth-Miller Kernersville Chapel is assisting the family. Memorials may be made to Behind the Blue Line – WSPD, PO Box 15031, Winston-Salem, NC 27113 or Cape Lookout National Seashore – Superintendent, 131 Charles St, Harkers Island, NC 28531. Lee was a great guy, & will be missed...! !